What Type of Plywood for Bathroom Floor? The bathroom floor gets wet. That usually means the underlayment and the subfloor also get wet. The floor must also handle the weight of the tub, shower, tiles and other fixtures. Tile floors are especially heavy with layers of cement board, mortar, tile or stone and grout. Using the right type plywood ensures a long-lasting floor. 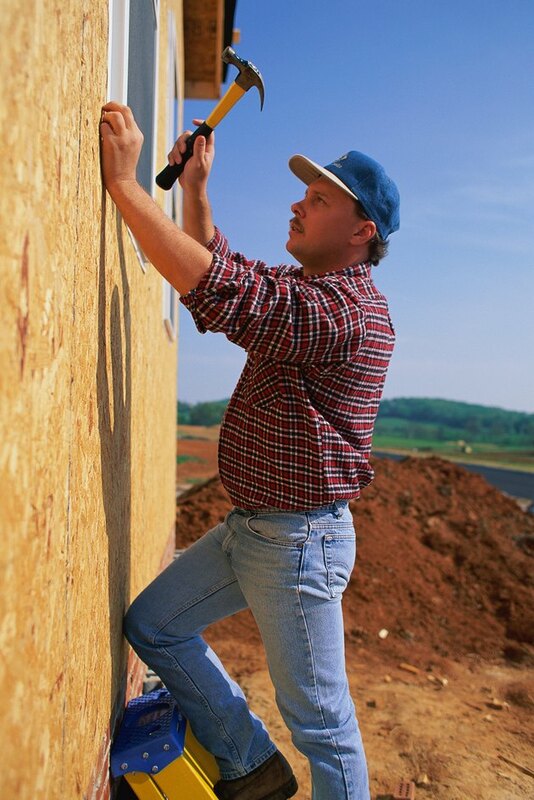 Plywood is found on building exteriors, roofs and floors. Tongue-and-groove plywood is manufactured specifically for subfloors. The subfloor rests directly on the floor joists and is the lowest layer of flooring material. Plywood three-quarters inch thick is the most common and the strongest. Plywood that is five-eighth inch thick also available for flooring, but using it restricts joist spacing and the types of finished flooring. Tongue-and-groove plywood subfloor material is span rated for use on floors and provides the necessary support in bathrooms for heavy floors and water-filled tubs. The second layer of flooring is the underlayment. Plywood underlayment adds strength to a floor, raises the floor or provides a fastening surface for the finished flooring. Plywood used for underlayment ranges from one-eighth inch to one-half inch, depending on the requirement or need. Most ceramic tile manufacturers require a minimum 1-inch thick floor, or they will not guarantee the installation. The deflection on a floor less than 1 inch thick causes the tile to crack or pull free of the mortar. Bathrooms require some form of underlayment for most flooring installations. Luan plywood is a special type hardwood plywood made with exterior grade or moisture resistant glue. It is made from the wood of the Lauan tree from the Philippines. Floor covering installers add luan for increasing height or providing a smooth surface for different types of vinyl flooring. The installer staples the one-quarter inch thick luan plywood to the underlayment or to the subfloor. Mortars and glues adhere to the plywood well, making it suitable for tile and vinyl installations.tile and vinyl installations. A product similar to plywood called oriented strand board provides similar strength when used as tongue-and-groove subfloor material. It carries the same span rating as similar tongue-and-groove plywood. The product is manufactured from thin strands or chips of wood that are glued and pressed together forming a board. Oriented strand board is becoming more common since it recycles scraps of wood and is cheaper than regular tongue-and-groove plywood. What Is the Difference Between Congoleum & Regular Vinyl Tile?